Developed and delivered by industry professionals, this Specialist Diploma is specially designed to provide marketers with essential skills in designing, executing, tracking, monitoring, measuring and improving online marketing campaigns and social media marketing. This Specialist Diploma is also focused on producing content (video, photos and media) for online marketing purposes. Backed by decades of experience in broadcast television, this programme will also impart the important fundamentals on making online content engaging. Find out the important skills in planning and executing an online and/or social media marketing campaign. Learn about the skills in making media for online and social media channels. Understand how to track, analyse and monitor on social media and online. Learn the ways to manage an online and/or social media crisis. Understand key issues pertaining to ethics when planning engagement or marketing initiatives. The principles of online/social media engagement. Gain knowledge in managing IP: creation, management, ownership, negotiation, control, disclosure and valuating. 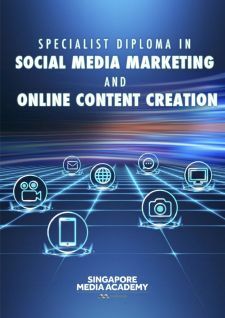 The Specialist Diploma in Social Media Marketing and Online Content Creation consists of 7 modules of study. All units will conclude with a compulsory assessment. Participants will be awarded the Specialist Diploma in Social Media Marketing and Online Content Creation from Singapore Media Academy upon successful completion of all modules. Participants will also receive a WSQ Statement of Attainment (SOA) upon successful completion of each WSQ unit and its assessment. She is currently the Project Manager of Mediafreaks Group of Companies, an award winning digital media company focusing on digital marketing, e-commerce and animation products and services. She was previously the Program Lead for Ideasinc – a nationwide entrepreneurship competition by Nanyang Technopreneurship Centre, NTU. Helping young Singaporean entrepreneurs kick-start their businesses by providing mentorship, start-up curriculum, industry networks and funding opportunities. Andrea graduated with an Honours Double Degree in Accountancy and Business (Marketing) from the Nanyang Technological University. She is currently a Digital Marketing Specialist and Project Manager of Mediafreaks Group of Companies, an award winning digital media company focusing on digital marketing, e-commerce and animation products and services. She is a trainer at local universities such as Nanyang Technological University and Singapore Management University for digital marketing for both students and professionals. She is Facebook Certified Planning Professional, and also holds Google Certifications in AdWords, Video, Display and Google Analytics. Nicole is a Mass Communications graduate who stumbled upon the magin of Digital Marketing while she was still in Nanyang Technological University as a recipient of the Nanyang Scholarship. After completing several successful online campaigns and multiple teaching stints, she remains in awe of the power of Digital Marketing and the role it has taken in place of traditional marketing. Her desire is to share her knowledge of this still-expanding, ever-evolving field with anyone whose curiosity in piques. In her journey, she has lectured budding students and experienced professionals alike at both her alma mater and Singapore Management University. Today, Nicole has earned a spectrum of Google Certifications; along with being a Google Ads Certified Professional, she is also certified in Analytics, Search, Display and Video. Being in the team of an award-winning digital media agency, she is well-versed with the backend of Facebook as she is with its perpetually-entertaining newsfeed. On a day to day basis, Nicole spends her time ideating content that cuts through online clutter and strategising media spend. ^Administrative Fees include Annual Medical Insurance Premium, Annual NLB Membership Fee, ICA Student Pass Application Fee, Lab Fee and SMA Student Access Card. All Information contained in this page is correct at time of publish (April 2019) and may be subjected to change.